On Monday, I spent some time talking about Piper-Heidsieck. 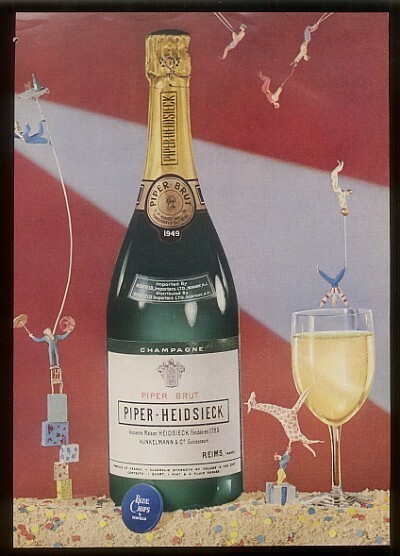 My thanks to Eric who sent me an image of a beautiful vintage poster of a Piper-Heidsieck bottle. It’s so appropriate considering Mad Men is set in the world of advertising. This print ad is from 1953, displaying the 1949 vintage. The bottle is appears identical to the one Pete opened in Sunday’s episode. If indeed it was a 1949 vintage, I have no doubt it cost our fictional character a fair amount of his fictional 1960s dollars. I bet it tasted pretty darned good though. One item I’d like to point out about the above ad is that the bubbly is poured into a regular wine glass and not a champagne flute. Now, maybe the good folks at Piper-Heidsieck can shed some light on that choice for me. In fact, the classic tulip shaped champagne flute was in wide use by the 1930s. However, a lot of people were still using the champagne coupe, from the late 1800s. (A myth states the coupe was molded from the breast of Marie Antoinette.) In fact, in 2009, we found the characters of Mad Men enjoying some Veuve Clicquot in coupes. To end on a note of utter whimsy, you’ll notice there is a miniature circus, including a rather talented giraffe, taking over the ad. Piper-Heidsieck is a Champagne House that’s always been slightly unconventional, even when everything was conventional in the 1940s and ’50s. In 2008 they embraced their inner Lewis Carroll and released an upside-down bottle designed by Viktor & Rolf. If you were feeling exravagant, you might also pick up an upside down ice bucket and flutes.